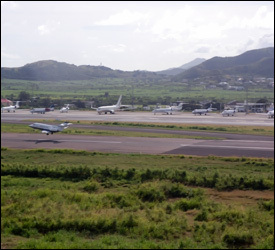 Scores of private executive jets are using the Robert L. Bradshaw International Airport for parking, Airport Operations Officer, Mr. Osbert Wilkins disclosed Wednesday. He said most of the jets, which range from the Learjet 25 to the Executive 737, will be parked until early January 2011. Their owners are either on St. Kitts, on Nevis or neighbouring St. Maarten. â€œFifteen jets are parked on the tarmac as we speak. One of the jets is parked here while the owner took a helicopter to nearby St. Barthâ€™s,â€ Wilkins told the Communications Unit in the Office of the Prime Minister (CUOPM) on Wednesday. He said the increase in ececutive jets are not hampering the operation of the scheduled arrivals and departures by American Airlines, Delta Airlines, US Airways, British Airways and LIAT. SCASPAâ€™s aim to provide a top-class service to passengers on executive jets when a world class Private Air Terminal Facility (FBO) at the Robert L. Bradshaw International Airport is completed. Construction of the first phase of the $20 million project by Veling Limited in the southeast corner of the airport is to start during the first half of next year and will be completed in two phases over the next 10 years.